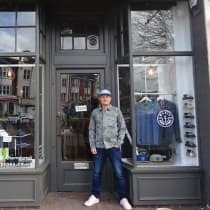 Founded by retail veteran Simon Porter in 2017, Born Store is a curated menswear and lifestyle store in the heart of the coastal town of Eastbourne. The boutique's primary focus is contemporary clothing and accessories that are underpinned by a timeless, relaxed aesthetic rather than fast-moving trends. Simon takes great care in curating his range, sourcing both established and up-and-coming brands from the four corners of the globe. "All of our products are chosen because of their quality and character. We hope people leave the store feeling like they've bought something they'll value for a long time."